52 Weeks #42: Merry Halloween! Huh? To those of you on the east coast. I can not believe it snowed 2 days before Halloween. But anywho, hope everyone is doing ok, sounds like Connecticut got hit pretty bad. 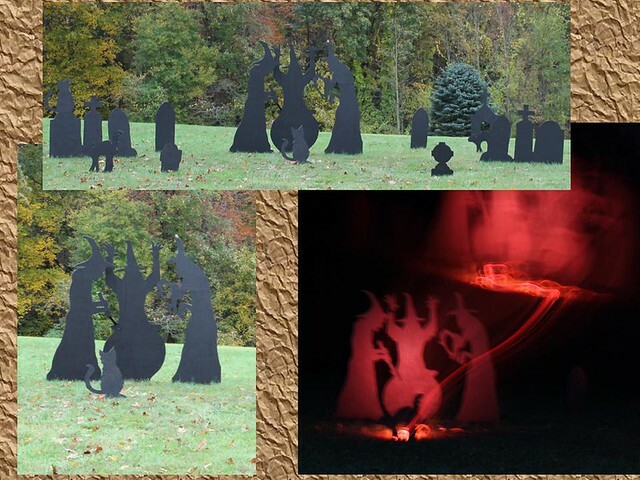 This weekend was the big Halloween Program at my work so I finally got to display the cut outs I have been doing. I did a lot of the cutting out, the tracing was done by another person and my staff helped with a few of the smaller ones. It came out looking pretty neat, even though I had to put the witches back up a few times due to wind. I really did have a lot of fun cutting these out. We have plans for a few more next year and I may also tackle something for home. Just one more thing on my to do list. They are all cut from 3/4” plywood and held up using rebar, pipes, and some pipe hanger tape. At home I am down to the wire on the craft fair. It is next Saturday, I have some stuff finished but am needing to make a few more duplicates of stuff so I have multiples. Here are a few more of the things I have decided to make. 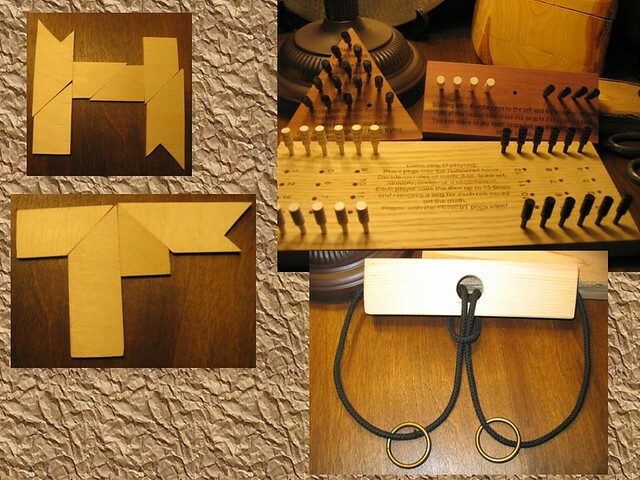 I have the Cut Up “T”, Cut Up “H” (and no that is not the proper solution :) ), Ox Yoke Puzzle, and three different peg games (Solitaire, 8 Men on a Raft, and Pull the Peg) Pull the peg is an idea based on Shut the Box. I decided to do it in a head to head version and it will come with 2 sets of dice. So with the multiples of these to make it gives me about eight different games or puzzles. This is a free craft fair put on by our HOA and the first time my wife and I are trying this. So we will see how it all goes, my wife has made Tailgating checker boards that roll up as well as some crayon rolls. I hope everyone has a productive and safe week in and out of the shop. Some of my favorite stuff of yours so far. The halloween cut outs are really cool and I like the puzzles and games…we’ll have to check in after the weekend and see how things went. I have a bunch of projects to do also for this weekend.